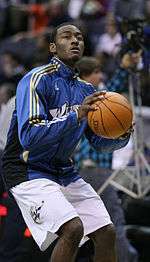 Johnathan Hildred Wall, Jr. (born September 6, 1990) is an American professional basketball player for the Washington Wizards of the National Basketball Association (NBA). A Raleigh, North Carolina native, Wall was chosen with the first overall pick of the 2010 NBA draft by the Wizards after playing one year at the University of Kentucky. He plays the point guard position and is a three-time NBA All-Star. Wall is the son of Frances Pulley and John Carroll Wall, Sr. When Wall was 8 years old, his father was released from prison but died of liver cancer a month later, on August 24, 1999 at the age of 52. Throughout his childhood, Wall's mother worked multiple jobs to support Wall, his sister, Cierra, and his half-sister, Tonya. Wall's father was incarcerated due to the armed robbery of a convenience store and had served time earlier for second-degree murder. The death of Wall's father caused him to frequently reject the authority of adults and led to a path of violence and occasional fighting, mostly in middle school. 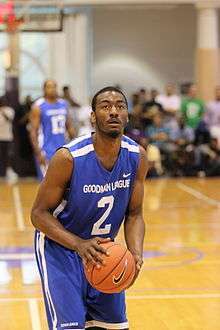 Wall played AAU basketball for D-One Sports. Wall played his first two years of high school basketball at Garner Magnet High School in Garner, North Carolina. After his second season, his family moved to Raleigh and Wall repeated his sophomore year at Needham B. Broughton High School. Despite a very impressive tryout, Wall was cut from the Broughton basketball team for attitude-related issues. As a result, Wall transferred from Broughton to Word of God Christian Academy, also in Raleigh. It was in Word of God Christian Academy that Wall began mending his attitude related issues. Wall's coach Levi Beckwith worked with Wall in order for him to stop demeaning his teammates for missed layups and later worked on his facial expressions. In the summer of 2007, after his sophomore year of high school, Wall was invited to the 2007 Reebok All-American Camp in Philadelphia. Wall distinguished himself by scoring 28 points against a team that featured future lottery pick Brandon Jennings. In 2008, Wall played in the Elite 24 Hoops Classic. He scored 10 points and earned co-MVP honors with Dominic Cheek, Maalik Wayns and Lance Stephenson. As a fifth-year senior in 2009 Wall averaged 19.7 points, 9 assists and over 8 rebounds for Word of God Christian Academy and was ranked as one of the best high school basketball players in his class. Wall led Word of God to the North Carolina Class 1A state championship where they were defeated by United Faith Christian Academy 56–53 after United Faith's Ian Miller hit a 40-foot shot at the buzzer. Wall scored 11 points in the game. He was selected to participate in the 2009 Nike Hoop Summit in Portland, Oregon. He scored 13 points to go along with 11 assists and 5 steals. He was also selected to play in the 2009 Jordan Brand Classic at Madison Square Garden where he notched 6 assists. Wall was originally recruited by the University of Kentucky, Duke University, Georgia Tech, and the University of Kansas. Wall committed to attend the University of Kentucky on May 19, 2009. He was suspended by the NCAA from Kentucky's first exhibition game and first regular season game for travel benefits he received from his AAU coach Brian Clifton, a certified agent at the time. In his first action as a Wildcat, in an exhibition game against Clarion University of Pennsylvania, Wall led his team with 27 points and 9 assists in 28 minutes of playing time. In his collegiate debut at Kentucky versus Miami University, Wall made the game winning shot with .5 seconds left on the clock to help then # 5 ranked Kentucky win. He finished with 19 points, 2 rebounds, 5 assists, and 3 steals. On December 29, 2009, against Hartford, Wall set the Kentucky single game assist record with 16, 11 in the 1st half, with only 1 turnover. The mark was previously held by Travis Ford, at 15, and was broken on Ford's 40th birthday. Wall scored 9 points, failing to break double digits for the first time in his college career. Because Wall was a fifth-year high school senior in 2009 and would turn 19 by the end of the year, some sources argued that he would be eligible for the 2009 NBA draft. League rules stated that American players must turn 19 during the year of the draft and be a year removed from their regular high school class. NBA spokesman Tim Frank told sportswriter Chad Ford that the league was not sure if Wall met the second criterion, and that league officials would need to "do [their] due diligence to determine his eligibility". However, Wall announced in April 2009 that he was not entering the 2009 NBA draft, where he was expected to be the first player taken, and would attend Kentucky instead. On April 7, 2010, Wall announced that he would forgo his final three seasons of collegiate eligibility and enter the 2010 NBA draft, where he was expected to be the first overall selection for the Washington Wizards. On May 3, Wall signed with agent Dan Fegan. On June 23, 2010, Reebok revealed Wall as its latest signing, casting him as the face of its latest basketball shoe, the ZigTech Slash. On June 24, 2010, Wall was drafted as the first overall pick by the Washington Wizards in the 2010 NBA draft. On June 25, 2010, Mayor Adrian Fenty of Washington, D.C. declared June 25 as John Wall Day on a plaque handed to John Wall during his Washington Wizards' presser. Wall was named the Most Valuable Player of the 2010 Las Vegas Summer League, averaging 23.5 points, 7.8 assists, 4.0 rebounds and 2.5 steals in 32.3 minutes per game. Wall made his NBA debut in a 112–83 loss to the Orlando Magic. He had 14 points, 9 assists, and 3 steals. In his third game, his first home game, he tied a franchise record with nine steals, and became only the second player in NBA history to get nine assists or more in each of his first three games. On November 10, Wall recorded his first career triple-double with 19 points, 10 rebounds, and 13 assists to go along with 6 steals and only 1 turnover. Wall was the third youngest player to record a triple-double in NBA history. John Wall was named 2011 Rookie Game MVP during the 2011 All-Star Weekend. Wall was also named Eastern Conference Rookie of the Month from January–April and finished 2nd in Rookie of the Year voting behind unanimous selection Blake Griffin and was named to the NBA All-Rookie 1st Team. Wall would play in and start all of the Wizards' 66 games during the 2011–12 lockout shortened season. He was selected to play in the NBA All-Star Weekend Rising Stars Challenge. He was drafted to play for Team Chuck, a mix of rookies and sophomores. Wall finished the season averaging 16.3 points, 8.0 assists, and 4.5 rebounds per game. Wall missed the beginning of the 2012–13 because of a knee injury. On January 12, 2013, he returned against the Atlanta Hawks to a standing ovation, scoring 14 points, handing out 4 assists, and gaining 2 rebounds in a Wizards win. On March 18, 2013, Wall was named the Eastern Conference Player of the Week for games played between March 11 and March 17. 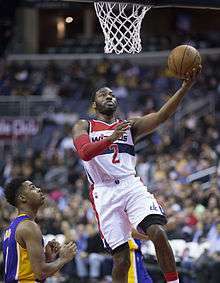 In a road game against the Los Angeles Lakers on March 22, Wall recorded 24 points, 6 rebounds and a career-high 16 assists in a win. On March 25, in a win over the Memphis Grizzlies, Wall scored a career-high 47 points to go along with 7 rebounds and 8 assists. Wall ended the season with averages of 18.5 points, 7.6 assists, and 4.0 rebounds a game. On July 31, 2013, Wall, labeled by the Wizards as a designated player, signed a five-year contract extension worth approximately $80 million. On January 22, 2014, Wall recorded his second career triple-double with 28 points, 11 rebounds and 10 assists in a 111-113 overtime loss to the Boston Celtics. On January 30, 2014, Wall was selected as an East reserve for the 2014 NBA All-Star Game, making this his first All-Star team. On February 15, 2014, Wall was voted the dunker of the night in the 2014 NBA Slam Dunk Contest, with a double pump reverse assisted by the Wizards' mascot, making it the first win by a Washington Wizard. On February 27, 2014, Wall had 31 points and 9 assists as the Wizards won a triple overtime game against the Raptors 134-129. It was the franchise's first triple-overtime game since 1975. On March 1, 2014, Wall recorded a then career-high 16 assists, along with 17 points, 3 rebounds, and 2 steals, in a 122-103 victory over the Philadelphia 76ers. Wall averaged 19.3 points, 8.8 assists, and 4.1 rebounds on the season as the Wizards finished as the 5th seed in the East and qualified for the playoffs for the first time in six years. They went on to defeat the Chicago Bulls 4 games to 1 in their first round playoff match-up. After defeating the Bulls, Wall and the Wizards lost in the second round to the Indiana Pacers in 6 games. On December 8, 2014, Wall recorded 26 points, 7 rebounds, 3 steals and a then career-high 17 assists in a 133–132 double-overtime win over the Boston Celtics. Following the game, Wall dedicated the win to his close friend, six-year-old Damiyah Telemaque-Nelson, who had died of cancer earlier that day. When asked by a reporter "She meant a lot to you, didn't she? ", he broke down and started to cry. He later gave her family all of his gear that he wore that night, including his shoes which had Damiyah's name on them. He went on to tie his career-high of 17 assists, along with 21 points, on December 16 in a 109–95 win over the Minnesota Timberwolves. On March 14, 2015, Wall tied his season-high of 31 points while adding 12 assists in a 113–97 win over the Sacramento Kings. On April 3, he recorded 6 points and a then career-high 18 assists in a 101–87 win over the New York Knicks. On April 21, he recorded a Wizards playoff franchise record for assists with 17 as the Wizards defeated the Toronto Raptors 117–106 to take a 2–0 lead in their first-round playoff series. The Wizards went on to win the series with a 4–0 sweep, but lost their second-round series to the Atlanta Hawks in six games. After starting the 2015–16 season with six wins over the first 10 games, the Wizards went on a four-game losing streak between November 24 and November 28. Wall averaged 15.0 points, 5.5 assists and 2.3 steals per game over that losing stretch, and shot just 33.3% from the field. On December 1, Wall recorded a then season-high 35 points, 10 assists and 5 steals in a 97–85 win over the Cleveland Cavaliers, breaking the Cavaliers 9–0 unbeaten streak at home to begin the season, and broke the Wizards' four-game losing streak. Following the win over the Cavaliers, Wall stated "Every team is trying to make me make jump shots this year, so I was just being aggressive and getting to the basket. I got into a rhythm early and it helped us get going." Wall's shooting percentage over the first 14 games of the season was a career worst (.390), as was his 16.1 point average. The following day, in a loss to the Los Angeles Lakers, Wall recorded his first career back-to-back 30-point, 10-assist game, finishing the game with 34 points and 11 assists. On December 21, Wall recorded 12 points and a career-high 19 assists in a 113–99 win over the Sacramento Kings. On December 30, in a loss to the Toronto Raptors, Wall recorded his seventh straight double-double and 17th of the season. He averaged 22.6 points and 11.7 assists in 16 December games. He subsequently earned NBA Eastern Conference Player of the Month honors for December. On January 16, he recorded a season-high 36 points, 13 assists and 7 steals against the Boston Celtics, but missed a potential tying layup at the buzzer, as the Wizards were defeated 119–117. He topped his season-high mark on February 3, scoring 41 points in a 134–121 loss to the Golden State Warriors. Two days later, he recorded his fourth career triple-double with 18 points, a career-high 13 rebounds and 10 assists in a 106–94 win over the Philadelphia 76ers. On February 23, he recorded his second triple-double of the season and fifth of his career with 16 points, 12 rebounds and 11 assists in a 109–89 win over the New Orleans Pelicans. On March 16, he recorded his third triple-double of the season with 29 points, 12 assists and 10 rebounds in a 117–96 win over the Chicago Bulls. The next day, he recorded his second straight triple-double with 16 points, 14 assists and 13 rebounds in a 99–94 win over the Philadelphia 76ers. Following off-season surgery on both knees, Wall was rested in the second of back-to-back night games early on in the 2016–17 season, as a way of limiting his minutes. With eight assists against the Houston Rockets on November 7, Wall broke Wes Unseld's franchise record (3,822) for career assists. On November 21, he recorded 18 points, a season-high 15 assists and three blocked shots in a 106–101 win over the Phoenix Suns. By late November, his minutes restriction was lifted. In July 2014, Wall was selected as a member of the United States camp roster to compete for the 2014 FIBA Basketball World Cup team. Due to off-season knee surgery, Wall withdrew his name from consideration for USA Basketball's 2016 Rio Olympics team. Wall is a point guard and is known for his blazing speed and explosive athleticism. Wall's results at the draft combine of 10.84 seconds in the lane agility drill and time of 3.14 seconds in the 3/4 court sprint further demonstrate Wall's elite horizontal and vertical quickness. Along with having elite athleticism, Wall possesses good size for an NBA point guard, being 6'4" and having a 6'9.25" wingspan. Due to his athleticism, a large focus of his game is attacking the basket and emphasis on pushing the tempo in transition. Using his explosiveness and a myriad of finishing moves, Wall was able to achieve an impressive field goal percentage of 61.9% within three feet of the basket in 2014–15. Wall's use of floaters and runners also account for his impressive field goal percentage of 40% within 3–10 feet of the basket (2014–15 season). Along with his ability to get to the rim using his speed and ball handling, Wall also has a tremendous ability to pass the ball, averaging 8.7 assists for his career (as of the end of the 2014–15 season). 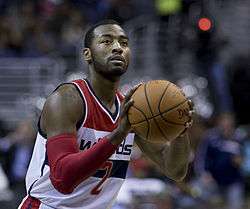 Being a point guard, Wall constantly uses the pick-and-roll to initiate the offense, which contributes to his high assist total. In the earlier stages of his career, he was criticized for the amount of turnovers he committed, as he was dubbed "very turnover prone". While increasing his assist to turnover ratio throughout his professional career, Wall still averages 3.7 turnovers per game (as of the end of the 2014–15 season). While Wall's strengths do not include shooting, he has seen his shooting improve throughout his NBA career. Wall has consistently improved his midrange jump shot over the course of his career, forcing defenders to not go under screens as often. After only making 49 three-pointers on 24% shooting in his first three years in the NBA, Wall was able to elevate both three-point makes and three-point percentage to 108 three-pointers while shooting his best percentage of .351 from long range during the 2013–14 season. Wall has also demonstrated his ability to defend the basketball at an elite level, resulting in him being placed on the NBA All-Defensive Second Team in the 2014–15 season. In 2013, after signing a five-year contract with the Wizards, Wall purchased a home in Potomac for $4.9 million. The two-acre property, which has eight bedrooms, six garages, and 17,980 square feet, was selected to accommodate Wall's mother, siblings, and guests. In 2016, Wall received the Stewart B. McKinney Award for his work to end homelessness after he donated $400,000 to Bright Beginnings. ↑ Lamb, Amanda (May 4, 2009). "Prep basketball standout cited with breaking and entering". WRAL.com. Retrieved October 1, 2010. 1 2 3 Prisbell, Eric (June 20, 2010). "Despite the angst that his father's jail stint and death created, John Wall reveres him". Washington Post. Retrieved October 1, 2010. 1 2 3 Abrams, jonathan (June 23, 2010). "Wall Leaves His Troubled Path for the Top of the Draft List". The New York Times. 1 2 King, Jason (December 4, 2009). "Behind John Wall". rivals.com. Retrieved October 1, 2010. ↑ "2008 ELITE 24 BASKETBALL GAME RESULTS". InsideHoops.com. August 22, 2008. Retrieved September 30, 2010. ↑ Krider, Dave (May 19, 2009). "Kentucky Lands Star PG Wall". MAXPREPS.com. Retrieved September 30, 2010. ↑ "Rivals.com Ranking – Rivals150 for class of 2009". Yahoo! Sports. April 16, 2009. Retrieved October 1, 2010. ↑ "USAB: Getting to Know The 2009 USA Nike Hoop Summit Team: John Wall". USABasketball.com. April 1, 2009. Retrieved September 30, 2010. ↑ Haubs, M. "Nike Hoop Summit Scouting Reports". The Painted Area. Retrieved September 30, 2010. ↑ "Derrick Favors Leads Black Jerseys to Victory and Earns Co-Most Valuable Player Honors in 2009 Jordan Brand Classic". Nike.com. April 18, 2009. Retrieved September 30, 2010. ↑ Katz, Andy (May 20, 2009). "John Wall commits to Kentucky Wildcats". ESPN. ↑ DeCourcy, Mike (October 30, 2009). "Kentucky freshman John Wall to be suspended two games by NCAA". Retrieved July 21, 2010. ↑ "Wall goes for 27 as No. 4 Kentucky Rolls Past Clarion". UK Athletics. Associated Press. November 6, 2009. Retrieved November 9, 2009. ↑ Ford, Chad (April 22, 2009). "Buzz from the Nike Hoop Summit". ESPN. Retrieved October 3, 2009. ↑ "John Wall Not Entering 2009 NBA Draft". Sports.espn.go.com. April 22, 2009. Retrieved March 22, 2010. ↑ Givony, Jonathan (May 3, 2010). "John Wall Signs with Dan Fegan and BEST". DrafExpress.com. Retrieved May 3, 2010. ↑ "Reebok Announces New Signee And New ZigTech Kicks". BleacherReport.com. June 24, 2010. Retrieved October 7, 2013. ↑ Steinberg, Dan (June 25, 2010). "John Wall arrives in D.C.". WashingtonPost.com. Retrieved July 21, 2010. ↑ Packham, Drew (July 18, 2010). "Wall leads All-Tournament Team". NBA.com. Retrieved July 18, 2010. ↑ "2010 NBA Summer League". NBA.com. Retrieved October 1, 2010. ↑ Lee, Michael (October 29, 2010). "Wizards open with a blowout loss". The Washington Post. Retrieved October 29, 2010. ↑ Wilbon, Michael (November 3, 2010). "Wizards' season depending heavily on rookie John Wall". The Washington Post. Retrieved November 3, 2010. ↑ "John Wall gets triple-double, Yao Ming gets injured in Wizards' win vs. Rockets". ESPN. Associated Press. November 10, 2010. Retrieved November 10, 2010. ↑ Lynch, Mike (November 11, 2010). "Wall becomes 3rd-youngest to record triple-double". TrueHoop. ESPN. Retrieved November 11, 2010. ↑ John Wall: "It's been very tough for me"
↑ "Wizards, Wall agree to contract extension". NBA.com. July 31, 2013. Retrieved August 1, 2013. ↑ "Notebook: Celtics 113, Wizards 111 (OT)". NBA.com. January 22, 2014. Retrieved January 22, 2014. ↑ Michael, J. (November 4, 2016). "WIZARDS WILL REST JOHN WALL ON BACK-TO-BACKS UNTIL FURTHER NOTICE". csnmidatlantic.com. Retrieved November 6, 2016. ↑ "Magic use second unit to overcome Wizards 88-86". ESPN.com. November 5, 2016. Retrieved November 6, 2016. ↑ "Harden's 32 points, 15 assists lead Rockets past Wiz 114-106". ESPN.com. November 7, 2016. Retrieved November 7, 2016. ↑ "John Wall breaks Wes Unseld's Wizards' assists record". NBA.com. November 7, 2016. Retrieved November 7, 2016. ↑ "Beal's career-high 42 points lead Wizards over Suns, 106-101". ESPN.com. November 21, 2016. Retrieved November 22, 2016. ↑ Michael, J. (November 27, 2016). "MORNING TIP: HEAVY MINUTES PILE UP ON JOHN WALL, BRADLEY BEAL". csnmidatlantic.com. Retrieved November 27, 2016. ↑ "Wizards' John Wall buys Potomac mansion for $4.9 million". WashingtonPost.com. September 4, 2013. Retrieved May 22, 2016. ↑ Whitacre, Jake (September 21, 2016). "John Wall to receive award for his work to end homelessness". Retrieved September 21, 2016. Wikimedia Commons has media related to John Wall.